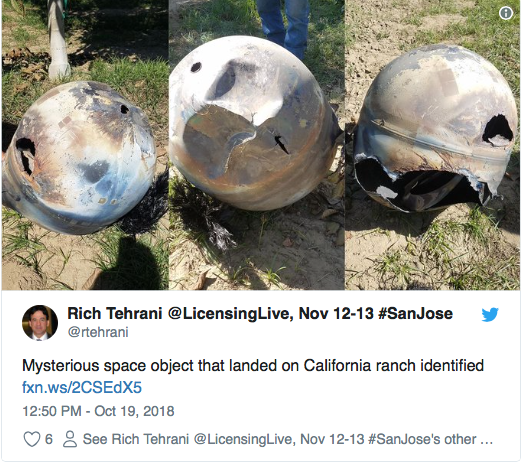 Kings County Sheriff's Office, California, received an unusual call on October 18 from a walnut farmer who claimed to have found a strange, large metal object of unknown origin that had smashed into his orchard, local news outlet Kron4 reported, citing the sheriff's office. When officers arrived at the site, they found a helmet-like, charred, metallic object and assumed that it was part of a satellite. After the sheriff's office inquired with the nearby Vandenberg Air Force Base, which conducts launches of rockets into space, on the origin of the object, it turned out to be a fuel tank from a communications satellite owned by Iridium Communications, which provides satellite telephone services around the world. An Iridium representative, contacted by the police, confirmed that it was a part of their decommissioned Iridium Satellite #70, launched between late 1997 and early 1998. The satellite had been orbiting Earth, along with other man-made space junk, until it eventually re-entered the atmosphere. It's unclear where the rest of the satellite crashed.